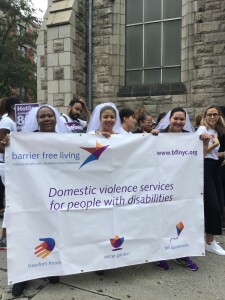 Team members of Barrier Free Living’s domestic violence programs walked in this year’s Bride’s March on September 26. The Gladys Ricart and Victims of Domestic Violence Memorial Walk/Brides’ March is an annual event which was started in New York City in 2001 to remember Gladys Ricart, a Dominican woman from Washington Heights, who was murdered in New Jersey on September 26, 1999, by her abusive former boyfriend on the day she was to wed her fiancé. The first March took place on September 26, 2001, the second anniversary of Gladys’ murder. The idea for the March was originated by Josie Ashton, a young Dominican woman from Florida, who was moved by the murder and outraged at the media and community’s insensitive response to Gladys’ murder. Josie resigned from her job and sacrificed more than three months of her life away from her then young family to walk, in a wedding gown, through several states down the East Coast ending in her home state of Florida, all in an attempt to draw attention to the horrors of domestic violence.